The Arc of Madison County has been supporting people with intellectual disabilities for more than 50 years. In that time, the various means of support have changed dramatically. And in just the past few years, research has shown the best way to support those with intellectual disabilities is to involve them in the community. Where in the past, most support organizations focused on offering a place to just spend their time, now the focus is on improving life skills, volunteering as well as job training and support. This is a big shift, which requires much more education, especially to show the community what a positive impact those with intellectual disabilities can have. JB Communications Group’s Principal, Jackie Brown, has had the honor of sitting on The Arc of Madison County’s Board of Directors for several years. 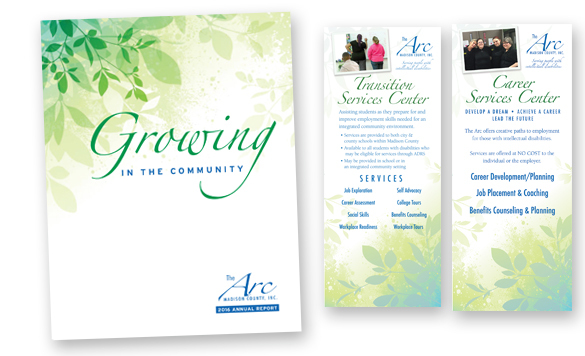 As she watched the focus shift, she knew the marketing collateral for The Arc would need to support that shift as well. As it is a non-profit, the budget for marketing and advertising needs to be as small as possible to allow more funds to go to the core functions. JB Communications Group donates our time and looks for ways to produce cost-efficient marketing pieces. The Arc staff has enjoyed having these materials to assist in their efforts to educate families, peers, political leaders and the community at large. The client families have really enjoyed seeing their loved ones thrive in the new jobs, volunteer opportunities and even through taking field trips.